Russell Automotive Centre and Garage Express are located in Kingsbury Trading Estate in London. These two garages are owned by Jane and Steve Russell and both are ranked in the top 10 garages in London on the Good Garage Guide. Russell Automotive Centre opened in 2007 as an Audi, Volkswagen, SEAT, and Skoda independent garage with Bentley being included a few years later. Steve, Jane’s husband is a VW and Audi Master Technician, so opening this business first made logical sense. The garage took off very quickly, earning an award for being the best independent Audi service provider within 10 months of trading. When asked how Jane and Steve ensure these garages are both run efficiently and with a focus on good customer service, Jane spoke about their great service team. Even though these garages are separate, every customer is important and Jane strives to ensure that they have the best possible journey from booking and dropping off their car to picking it up. Initially, Russell Automotive Centre would pass on other brands of cars to local garages so as not to dilute their brand. However, when they were given the opportunity to expand their business into a larger premises they decided to open a new all makes garage for general repairs- and Garage Express was born. The building, which contains both Russell Automotive and Garage Express, has a large service reception area with separate teams of technicians working in each garage. Russell Automotive Centre has specialist diagnostic equipment with regular software updates and manufacturer trained technicians. Garage Express carries out MoTs, services and repairs with technicians that have more of a diverse knowledge and more general diagnostic equipment. Russell Automotive has been a Gold Award Winner as Independent Service Providers at the Audi Driver International event every year since 2008. It also won the Independent Garage of the Year category at the 2013 Motor Trade Awards. The owners say that good reviews, saving people money, good service and solving a problem no one else can are all really important. Their ethos is, if you treat a customer how you would like to be treated then you will always be right. Communication is absolutely key to the business - they believe that customers need to be communicated with so they can make other arrangements if need be. Jane enjoys being an advocate for the industry. She is a member of the Independent Garage Association executive committee and is passionate about improving consumer options for the independent side of the garage industry. She loves being a mentor and offering advice to others looking to break into the industry. The garage was part of a pilot scheme offering work experience to students with Work Ready- a program at a local college helping students from less-privileged backgrounds in providing career opportunities and training. She was given the opportunity to speak at the House of Commons about her businesses’ collaboration with this program. 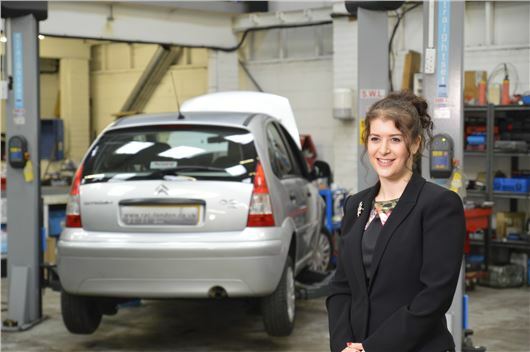 She is passionate about this industry and wants to change the perception of independent garages which are good places to go to and offer good quality service. With reviews like “will continue to use Russell Automotive and have already told my friends” and “my endless searching for a decent garage paid off when I found Garage Express” it’s easy to see why Russell Automotive Centre and Garage Express are among the top 10 garages in London. Russell Automotive Centre and Garage Express are in Brent, London. Have you visited? Leave a review on the Russell Automotive Centre and Garage Express Good Garage Guide pages.